Or do you just think Daylight Saving (called Summer Time in the UK) is a nuisance and should be done away with? Did you know that "Daylight Saving" was instituted by the federal government in 1918, in an effort to conserve energy producing materials that were needed in the war effort? The theory being that with an extra hour of natural light in the evenings, less artificial light would be needed. After the war the idea was dropped until WWII, when it was once again mandated, now as "War Time." 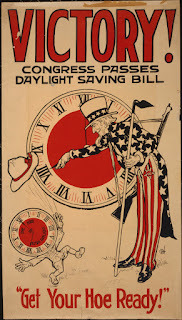 After the war, "Peace Time" was back in effect and the issue of daylight saving time was handled on a local level. This led to a great deal of confusion as different locations were constantly operating at different times. The Uniform Time Act was passed in 1966 to solve the problem. States were given the option to opt out of daylight saving time if they passed proper ordinances. I don't think there there is much evidence that Daylight Saving actually saves energy. So why don't we just do away with it? REDS, what do you think? Hate it? Love it? Want that extra hour of sleep tomorrow? Let's have a REDS poll! LUCY BURDETTE: Wait, we're springing ahead right? 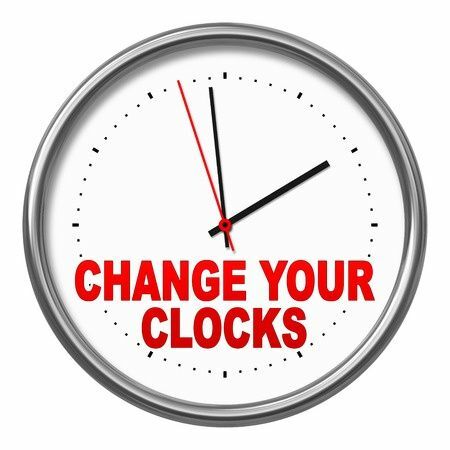 I don't like the changing in general--just about the time we figure out how to change the car clocks, it's time to change again. And here in Key West, we have a very civilized sunset celebration: have a drink, watch the sun go down and look for the green flash, and then eat. The change messes up the whole order of things. On the bright side, we're hoping this switch will dupe the cat into letting us sleep in. 7 am instead of 6 would be such an improvement!! HANK PHILLIPPI RYAN: This is a CONSTANT frustration. I hardly know what time it is on a daily basis anyway, so when it gets changed, it's huge mess. And then there was the year that I changed all the clocks, and then...Jonathan did, too So we were SO off. Now of course, some clocks change by themselves, yeesh, and that's even worse because I'm always tempted to change the already-changed ones. And we wind up with less sleep. right? which is further confusing.. Although not, actually, when I was in London in January and it was dark by 4:30... That's teatime, not sunset! It's more likely that we would just stay on summer time--after all, we are already at eight months out of the year, so why bother changing for the other four? READERS, what do you think? Would you do away with daylight saving, or keep it full time? Or just keep changing those clocks? PS REDS Alert! The winner of Marla Cooper's Terror in Taffeta is Kim Davis. And the winner of Glen Erik Hamilton's Hard Cold Winter is Mary Sutton. Send me your addresses at deb at deborahcrombie dot com and we'll get you fixed up! Oh, I cannot begin to tell you how much I despise the whole daylight savings thing. 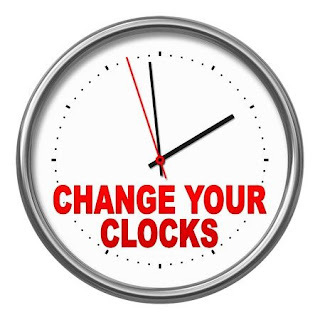 It's especially difficult when some have voted to opt out of the change, making it particularly confusing to know what time it is in various places. Since there no longer seems to be any relevant reason for messing with it, I think we just ought to stop changing the time . . . . I'd do away with it. Definitely. Though the big deal would be kids having to walk to school or the bus stop in the dark in the morning. With early rising little kids in the house, that 'fall back' time is a trial. There is a move to do away with it in New England and to go on Atlantic time.! HATE IT! Kids walked to bus stops, etc., before there was DST. The medical evidence should weigh more heavily than a retail lobby--it messes up my body clock for weeks after. Leave it the way it's supposed to be, for crying out loud! (Rant over). I hate DST. Spring forward and leave it there, IMHO. Done. As far back as I can remember I have LOVED Daylight Saving Time. I have more energy when it is light out later into the evening and I accomplish a lot more. I go for more walks, I do more around the house. To me, the darkness of standard time is depressing. I just can't get worked up about it, and don't understand why it's such a big deal. It only happens twice a year, and it isn't as if we're "losing" anything, since it gets gained back in the fall. As for setting clocks, I just take my cell phone around the house and check on the time with it. Cell phones, computers, even my car clock now all reset themselves automatically. Even our bedside alarm clock does now; it's an atomic clock that resets itself every single night at 2 AM, anyway. It is a complete nuisance and completely pointless. And dangerous. So many more accidents occur during the time changes, in both directions. Who actually believes you can cut a foot off the bottom of a blanket and sew it on the top and think you end up with a bigger blanket? It's (almost) enough to make me move to Saskatchewan, where they know better than to mess around with Time. Whew! Thanks for letting me rant. I am never in favor of losing an hour's sleep. That said, I do like it to be lighter later, the day seems so short when it gets dark at 4:30. What an old-timey poster, Debs! Get out your hoes. Okay, yeah. But you know? Just about the time we change the clocks, our ducks often come. Hmmm. Do away with it. Should have happened long ago. So far the noes have outweighed the yeas. But I've just seen the sun come out for the first time in a week and at this moment an extra hour of daylight doesn't seem too bad. There's also the fact with DST it's cool an hour later for morning walks in the summer. Still, I say, do one or the other! Debs, your list of problems that relate to the time change is so right. And all the sleep deprived people are now even more so, increasing car accidents and such. Let's just pick a time and leave it. Oh, and don't get me started on how confused and annoying my cats get each time we change the clocks! Wow! I'm surprised at the amount of distaste for Daylight Savings Time. I love having an extra hour of daylight, but the main reason for that in the past five years is personal. It means that I can drive the hour to my daughter's house and spend more time with the granddaughters before driving back. I'm not crazy about driving back after dark on the parkway I use because it's a popular deer crossing, and, well, I'm not crazy about driving at night anyway. So, for that reason alone, it's worth the lost hour of sleep. I hate hate hate Springing forward, but must admit I enjoy the extra hour of sleep when we Fall back! There's no good argument for Daylight Savings time, other than I personally, prefer it be light until 9pm, as it is up here in Maine, rather than dawn at 4:30 in the morning. I say pick a time and stick with it! Hate time changing! Since my eyes grew older than the rest of me about 30 years ago, I have joined the make daylight savings time the year around time group. With standard time dark comes at 4:30ish in CT and my car needs to be safely in the garage...no afternoon tea, no matinee performances. So, I say, "spring forward one last time and leave it there!" Added benefit: no need to change the car clock with its ridiculously little push buttons! I'm in bed already. Can't steal an hour of my sleep. I like the extra hour of sun in the evening. Changing to and from Daylight savings time leaves me tired and sick twice a year. I really hate it. I would prefer just to stay on DST (so that the sun would be brightest at 1 p.m.) for the whole year. Speaking as an owl, the extra brightness in the morning is just a pain -- I much prefer extra light in the evening.